Inverter generators provide the safest source of electric power for expensive and power-sensitive appliances such as TVs and computers. The reason is such equipment require pure sine-wave type-and hence stable-AC power source that does not surge at all. So, how do inverter generators create such clean power? They do so by first generating normal AC power, before converting it to DC. This DC power is then inverted back to a more stable AC electric power output. Besides being lighter than their conventional counterparts-as the best inverter generator reviews below will show-their performance is amazingly good. Continue reading to discover their other more incredible features and capabilities. Why You Need The Inverter Generator? 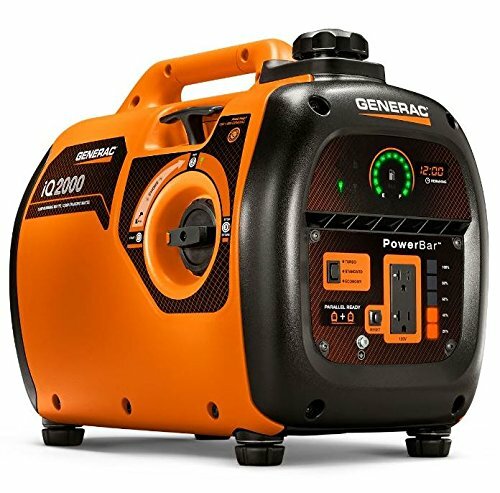 Increased Portability – Inverter generators are astonishingly small and lightweight considering the electrical generator thump they pack. Sizes that are a few cubic feet and weights as low as 30 pounds are only realizable in inverter generators. Even more surprising is the fact such generators are output enough power for a typical family needs. What does this translate to? A Powerful and compact generator that is convenient not only to transport but also to store. High fuel efficiency – Conventional generators are fitted with huge fuel tanks with the main aim of enabling them deliver long run times. Since the main emphasize on inverter generators is lightweight and compactness, their fuel tanks are not as large. They compensate this by having fuel efficient engines, and a capability to alter engine speed to the available load. Note that conventional units, on the other hand, constantly run at 3600 rpm despite the load. The end result is, inverter generators utilize fuel more economically thereby saving fuel and hence money. Even then, their run times are still as high as 10 hours. Such run times are more than enough for most generator applications. Incredibly low Noise levels – Inverter generators are entirely designed, from start to finish, to be comparatively quiet. This’s achieved using quieter engines, sound dumping technology and special mufflers that effectively reduce noise to incredibly low levels. Additionally, since their engine speeds vary with load, when supporting a small load the noise they produce is reduced further. The constant disturbing noise of a typical conventional generator running is, therefore, unheard of in inverter generators. How Can I Find The Best Inverter Generator On The Market? All recreational generators are of the inverter type. The inverter technology enable them produce ultra clean output power. The power can, therefore, be used to power vulnerable appliances such as phones, laptops and TVs. They are also compact, lightweight and economical. These generators are Diesel and Petrol Generators which can either be in Single or Three phase power. They are suitable for all trade uses and applications. Since these generators are typically built tough, by use of steel rollover frames, and fitted with condenser-type alternators, they are ideal for heavy and resistive loads. This category includes the smaller ones all the way to Automatic Voltage Regulation (AVR) inverter generators. All the inverter generators in the range are suitable for powering domestic as well as small business appliances. Your choice of any particular one will greatly depend on the number of appliances you intend to power and their sizes. There are diesel, petrol and gas emergency backup generators. Auto-start types, for automatic starting, are also available. They are ideal for persons who live in storm-prone regions, and those living off-grid only relying on solar power. ② Then establish the size of generator that you need. So, how do you achieve this? Step 1: Take down the power requirements of all your device, carefully paying attention to their running and starting power. Step3: Note the number of appliances that you will be operating concurrently. It is important of getting power necessary to the run the appliances as well as the starting power. Reason being, for some appliances, their starting power can be up to 4 times their continuous running power requirements. This is especially the case for home appliances like Air conditioners, fridges, and electric deep fryers among much more. Take few minutes and perform calculations to enable you to know the size of generator that you need. If this information is not indicated in the appliances, contact the manufacturer or you can engage an electrician. 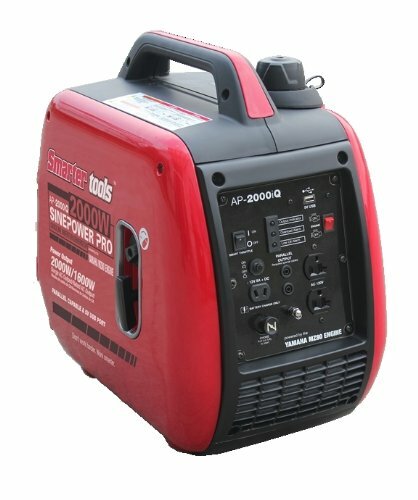 Read more: What size generator do I need? Below are extra important features to look out for so as to get the very best inverter generator. ✇ Safety Features – Such as Waterproof Outlets and Earth Leakage Protection. Since some worksites require Work Cover Approval generators, confirm the presence of these features to avoid trouble later on. WEN 56200i is an inverter generator that produces a very clean electrical energy. Its clean power output is made possible by cutting-edge electronic circuitry as well as advanced magnets. The power it outputs, therefore, resembles pure sine wave power ideal for use in sensitive appliances like laptops and TVs. It uses a powerful 4 stroke OVH engine. Its 2000 W surge-and 1600W running- is enough for powering virtually all home appliances in a typical home during power blackouts. The generator does not have to run on full capacity when supporting a smaller load. It, therefore, utilizes fuel very efficiently. WEN 2000 has impressive control panel features. It has two 3-pronged 120 Volts outlets, one 12 Volts receptacle and one 5 Volts USB port. This is in addition to a speed control throttle, output, Overload and oil lights. These features make it simple and easy for anyone to use. A handy energy saving mode enables it to use fuel economically. It, therefore, saves its user fuel, and hence money, in the long run. The generator is extremely quiet. When running at a quarter load, the generator outputs a mere 51 decibel noise level, making it quieter than an average conversation. It is compact and portable. It comes with a 1 gallon tank and a handle meaning it can easily be transported from one place to another. Its 2 year warranty is not the best available in the market. It, nonetheless boasts of a friendly customer service who are ready to answer any inquires about its functionality. Its run time at full load is about four hours. Such a run time is slightly on the lower side. It, nonetheless, delivers higher runtimes at half and quarter loads. 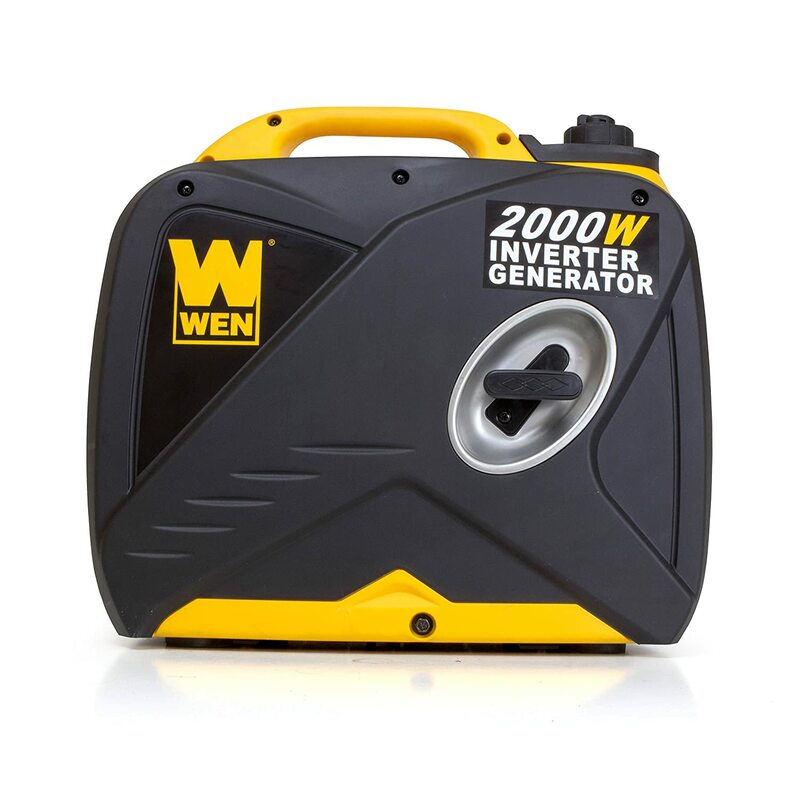 WEN 56200i is an excellent compact generator suitable for both small and big jobs. Its fuel saving mode is simply the winner as it enables a user save a lot of money in the long run. The fact I hardly makes noise means it is perfect for camping. You will be able to using it while camping without disturbing your fellow campers at all. Besides Yamaha EF2000iS having an inbuilt inverter technology, it also has a PWM (Pulse Width Modulation) control. These features enable the generator to output very clean electrical power. Its output can, therefore, be used to power even the most sensitive electrical appliance. The fact it weighs a mere 44 pounds means it is quite portable. Consumers have expressed their satisfaction of its portability efficiency and user friendly design. It also comes with a three year warranty at the time of purchase. The inverter generator has an impressive run time of 12 hours. With such a run time, the generator can operate reliably though minor power blackouts, satisfactorily providing the much-needed emergency power supply. It has Twin Tech capability. This ensures expandable connectivity as it makes it possible to pair together two similar generators. Has an inbuilt automatic warm up. Starting it is, therefore, much simpler compared to other inverter generators. Its 12 Volts charging plug is difficult to replace. Should a user wish to charge a higher capacity battery, they may have to use a different source altogether. It is designed in such a way that tipping over during transportation is very easy. This necessitates either transporting it is a space it fits in exactly or roping it to a trailer. The unit does not come with oil. This implies buyers should order for oil differently when they are buying this inverter generator for the first time. 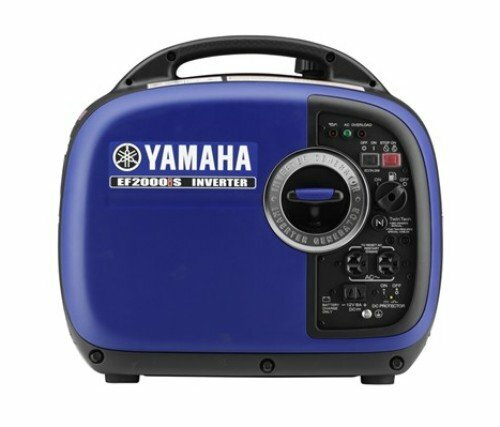 Yamaha EF2000iS outputs 2000 Watts of clean power that can be used to power vulnerable electronic devices. Its few shortcomings such as absence of oil plugs fade in significance compared to its great performance. 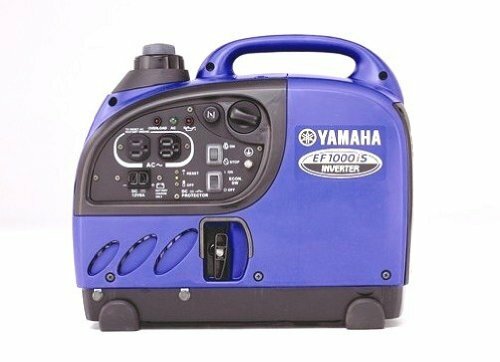 All users who have used this portable inverter generator have reported getting value for their money. 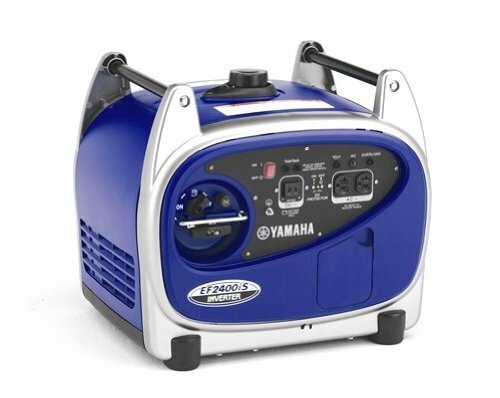 This Yamaha inverter generator is, therefore, a worthy investment. This champion inverter generator weighs a mere 48 pounds, and hence perfectly exemplifies the true definition of portability. Considering it outputs, 2000 Watts of clean electrical power, it outputs enough energy to operate quite a good number of ordinary household appliances. Yet its perhaps best feature is its attractive economy mode. This ​mode makes this champion inverter generator idle at the right level of power needed in any particular situation. Doing so enables the generator to not only save fuel, but also realize longer run times. The next equally important feature is the fact it is CARB compliant. A user, can, thus, use in in any jurisdiction and neighborhood without any problem. Lover of camping and tailgating will find this feature most attractive since they are not restricted on where they can camp and adventure. It has a high portability. 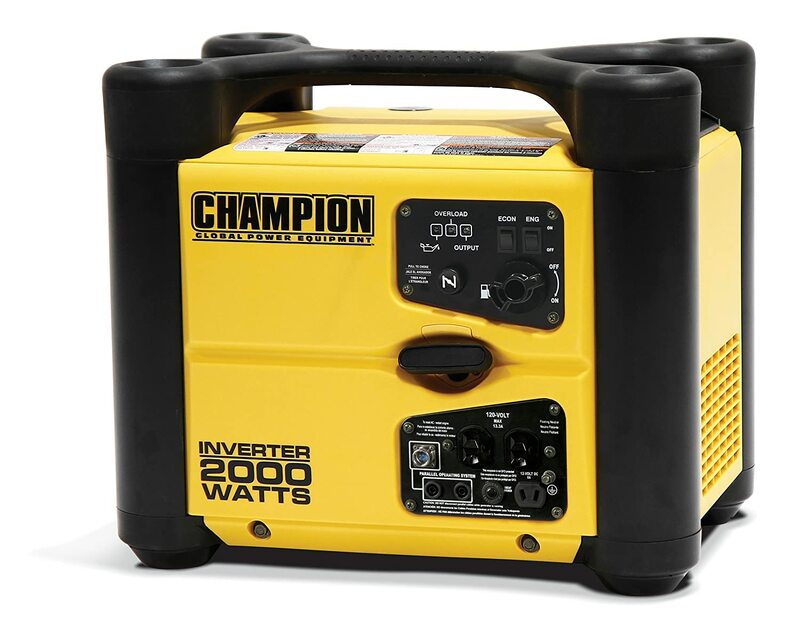 Weighing in at just 44 pounds, this champion generator model is among the most portable generators in its power output range. Its easy-to-carry handle further increases its portability. The generator is encased in a strong plastic casing that effectively protects it from possible mechanical damage. This feature makes it the best candidate for outdoor use in harsh environments. The generator delivers a noiseless operation, especially when running in economical load. You will be able to maintain a normal conversation while standing adjacent to the generator without raising your voice. Its would-be a strong selling feature Parallel Operation Kit is, unfortunately sold separately. Consumers wishing to increase their power output will, therefore have to incur extra costs to achieve this. The recommended SAE 10 W 30 oil is not included in the initial package. Users have to separately source for vital oil for them to use the generator for the first time. Champion Power Equipment 73536i is powered by a powerful 80 cc single cylinder, 4 stroke OHV engine. This is a very powerful engine, capable of outputting 1700 rated watts as well as 2000 maximum watts. It also comes with a 1-gallon fuel tank that enables it to run for up to 9 hours at quarter load. The engine’s low oil shut-off sensor delivers long life with minimal maintenance. Honda EU 2000I is easy to operate. It starts smoothly even though it uses the recoil start mechanism. It also doesn’t have any resistance issues and hence it can be used frequently without causing any discomfort. Honda EU2000I has impressive power capabilities and stability for an inverter generator of its size and specifications. It can dependably power vital household item during emergencies. Keeping this generator in good working conditions is very easy. 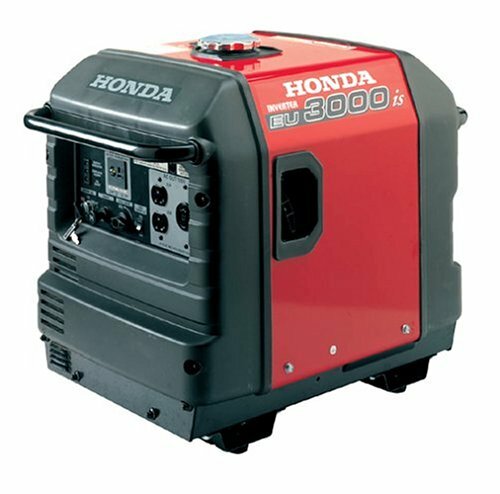 While for an ordinary generator changing oil is a taxing exercise, this Honda generator model is easy to handle. It also rarely breakdown, automatically shuts down safeguarding gears and engine from increased friction. Servicing the plugs, filters and other parts happens to be equally simple. This is because the parts are simply accessible. This makes cleaning and replacing intuitive, and can be undertaken without any special equipment or knowledge. Slightly more expensive compared to other comparable generators in the market. The generator compensates for this by having more sophisticated features that include Eco-Throttle technology and clean output power. Its total power output may not suffice for all appliances in a sizable household. Its rated power output can however support crucial appliances including security lighting during emergencies. Honda EU 2000I is among the best portable inverter generators of its output and specifications. Its tried and tested reliability, impressive extras and cutting-edge technology justifies its somewhat high cost. 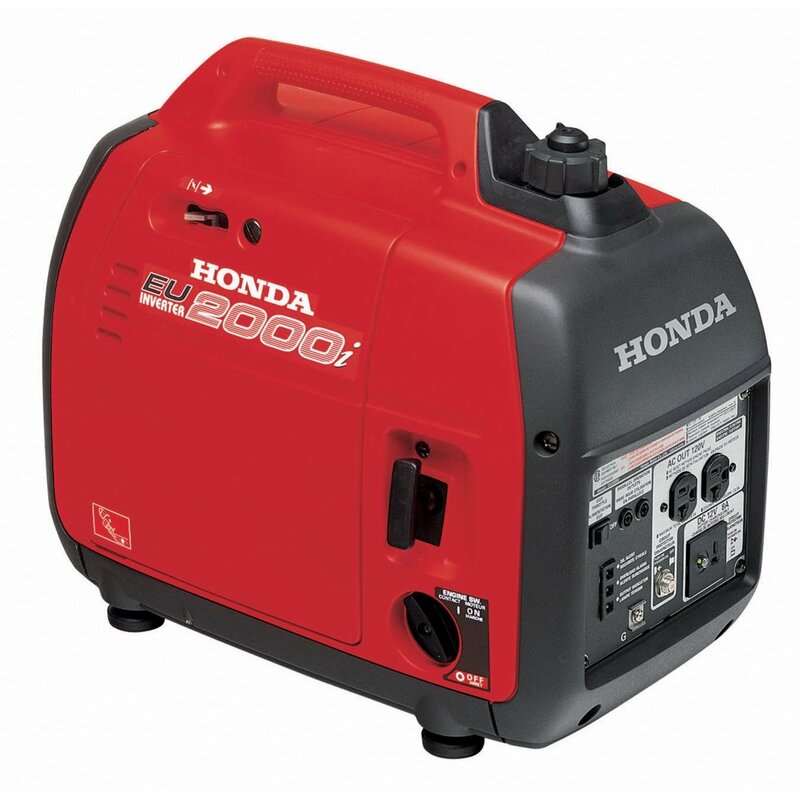 So, while we do not dispute the fact there may be cheaper generators out there, the truth of the matter is, Honda EU 2000i is worth its cost. 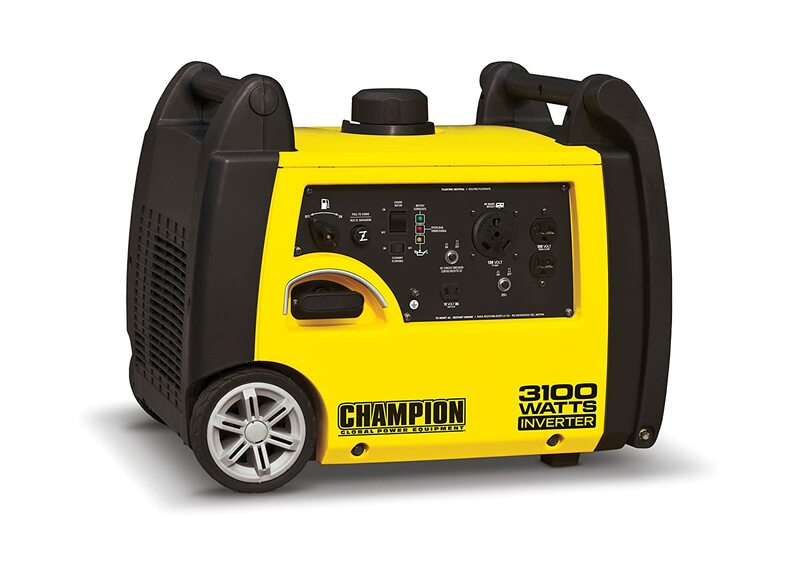 Champion 3100 watt inverter generator is compact, lightweight and hence portable. Weighing slightly less than 99 lb, it has a handy wheel kit making it ideal for camping purposes, RVs, cabins and many more. It’s powered by 171 cc single cylinder, Overhead engine. Its 3100 starting watts coupled with 2800 running watts, therefore, accords it a remarkable 8 hour run time when running on its full tank of fuel. This enables its user to rely on it for extended periods of time. It has an easy-pull start mechanism as well as a useful overload protection mechanism for safety. These two features make operating it both simple and safe. Apart from its economy mode, it delivers a quiet operation. This is in addition to more fuel savings as well as longer engine life. Its output power is clean, and hence can be used to run sensitive appliances. The noise it produces increases with load. At low loads, though, its noise level is commendable. What have best inverter generator reviews successfully revealed? An Inverter generator utilizes the cutting edge power generation technology for the benefit of its users. How? They capitalize on digital wave manipulation ability of an inverter; fine-tune their output and increase the engine’s fuel efficiency. With their minimal moving parts and hence reduced a chance of failure, their slightly higher cost is half accounted for. The other half is catered for by their high fuel efficiency that will, in the long run. Use inverter generators today to reap the benefits of high-quality generators capable of sufficiently powering are your appliances.